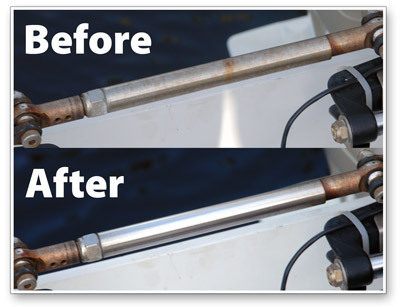 Metal fixtures on your boat are susceptible to oxidation and surface rust, especially if your boat is docked in salt water. Marine 31 Stainless Steel Liquid Polish stops oxidation and surface rust in its tracks! This easy-to-use, thick metal polish uncovers the mirror-finish that was present on your boat�s stainless steel, aluminum and chrome surfaces when it was new. Apply by hand or machine! Creates a mirror-finish on stainless steel, aluminum and diamond plate surfaces. Check out those beofre and after results! Marine 31 Stainless Steel Liquid Polish is perfect for removing light surface rust on your boat�s stainless steel rails and handles. Its thick formula is exceptionally easy to apply and remove, even in humid climates. The polish itself is white in color so if you accidentally get any on gel coat, you don�t have to worry about an unsightly stain. What�s more, Marine 31 Stainless Steel Liquid Polish can be applied by hand or machine! The secret to Marine 31 Stainless Steel Liquid Polish lies in its abrasive technology. The advanced abrasive in Marine 31 Stainless Steel Liquid Polish removes oxidation and staining without dulling the finish. While it�s technically considered a medium-cut metal polish, Marine 31 Stainless Steel Liquid Polish finishes more like an ultra fine metal polish, eliminating the need to follow up with a second step. Marine 31 Stainless Steel Liquid Polish is harbor-safe and eco-friendly. Shake well and ensure surface is cool to the touch. Not intended for clear coat surfaces. Apply a dime sized amount to a terry cloth applicator. Working on a small section at a time, thoroughly work polish into surface. Apply a dime sized amount to a foam or wool polishing pad. Work a small section (12� x 12�) at a time until surface is shiny. 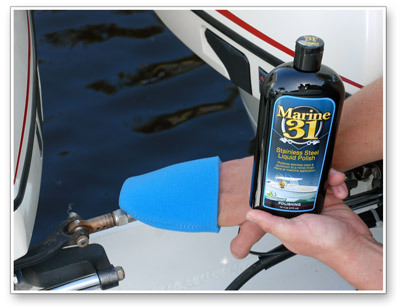 Protect the finish and lock in the shine with Marine 31 Stainless Steel Liquid Sealant.